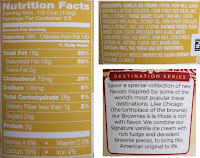 Alrightly, it's time for the flavor I anticipated most out of the new Haagen-Dazs Destination Series line up. I know it sounds simple, but we don't have a good H-D brownie flavor right now. In my mind, the sky is the limit here! Part of me wanted brownie swirls, but we get typical blocks instead. I take my first couple bites and I am shocked at what a large role the fudge is playing. I expected brownie, then vanilla, and then fudge. That said, it still looks glorious in my bowl. Ok, yeah, I'm confused. I thought this would be my very favorite of the seven new flavors but it's not really wowing me. Granted, I hold H-D to amazingly high standards, but I expected a brownie punch in every bite. Well, that last bite was close to what I expected... and then that next bite had too much swirl. Apparently I'm not a fan of their fudge swirl. And I'm done. Their were a decent amount of brownie pieces, and they are a decent size, but their flavor is no match for the fudge sauce. This is called brownies a la mode and while the fudge sauce should be a factor, the brownies should be number one here. Ha, my daughter wasn't impressed either, seems like the fudge got to her as well. Let's sleep on it and see how we feel about it next time. 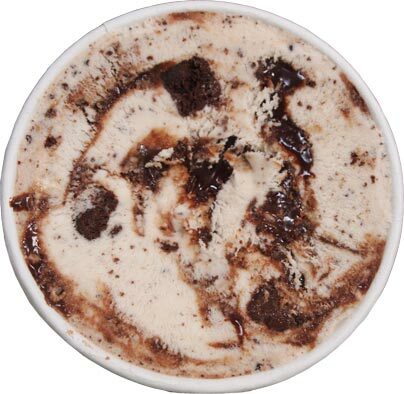 On Second Scoop: I take my few bites and sure enough, that fudge swirl is still front and center. Yes, more or less it's brownies a la mode, but I so wanted the brownie factor to be epic and then have a rich vanilla base and fudge swirl in support. Quality is fine but if I'm looking for brownies, I'm going to go somewhere else. Verdict? amp up the brownie factor! I completely agree - the fudge swirl dominates and makes this disappointing. I think big chunks of fudge brownies and maybe a caramel swirl instead of fudge would make this flavor so much better! I was so pumped to find this one, and I felt the same way. It was great because of the HD vanilla base but nothing amazing. I also bought the Tangerine and shortbread and was shocked how much I liked that one! I had (foolish?) high hopes for this too but this doesn't surprise me, unfortunately. HD almost always seems weak on "chunk" mix ins. dont be afraid, their cookie dough is excellent! But if I buy cookie dough ice cream, I'm buying FOR the cookie dough... There's enough of it? 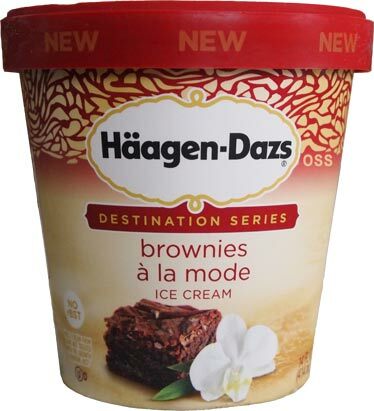 Sad to hear the semi negative reviews :( Brownies a la Mode is my all time favorite and was only sold in the HD shop until late 2015 and I couldn't be happier that I can buy it in stores now!!! Hope it becomes a permanent flavor. The fudge can be a little overwhelming but in such a good way! For some reason, the brownie chunks seemed much more moist when I used to buy it at the HD shop than in the pint at the store. Anyway, it's amazing to me! @Dubba interesting... I actually DISLIKE the chocolate chips... I may end up picking up a 14OZer of it this weekend when I go to try the Vanilla Tangerine Shortbread. @Stacie: have you tried the pint form yet? The reason I was so stoked in the first place was because I found pictures of the scoop shop version. I'm not sure this is a 1 to 1 comparison so I look forward to hearing back from you. @aol: toasted sesame brittle will be up next! Mixed on this one. It's a basic flavor done pretty well but either the fudge or the brownies had a weird aftertaste; maybe I'm just used to cheaper stuff than HD, but whatever it was brought down the rest of the ice cream that I otherwise enjoyed. I did see some brownie pieces but agree it doesn't quite deliver on the title. Throwing in the price and the nutritional factors, I'd pass on getting this again and would stick with B&J's Half Baked when I want brownies and vanilla ice cream. Haven't had much HD in the past, but I will still try Mayan Chocolate and Tangerine Shortbread as the flavors sound intriguing. I'm still looking forward to trying this. It looks like it might be a good replacement for 2nd Street's Tons of Brownies. I still miss that flavor! Am I the only one who loved this? 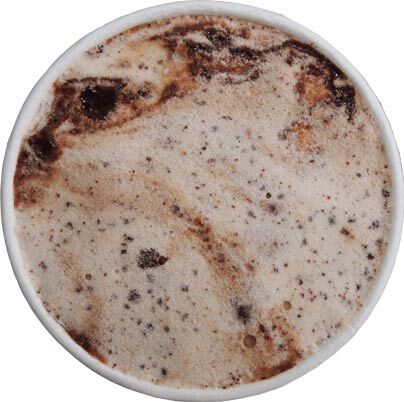 The swirl didn't bother me at all; I actually wished for more of it in my pint. Tasted just like Hershey's syrup. I hope other's will like it as well so it will stick around for a while. 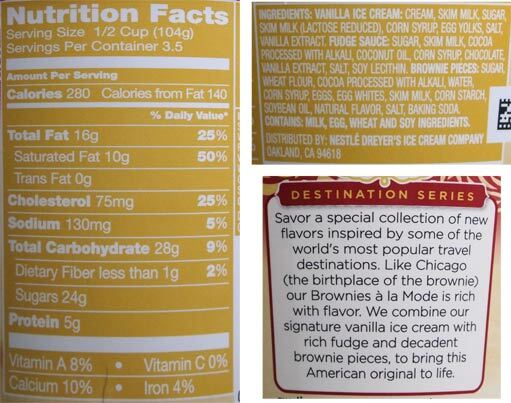 @Anon: if you like it, that's cool, and I get the hershey's comment, but I think the sticking point is the lack of a nice strong brownie punch to a flavor that starts with the word brownie. This sounds amazing and I love chocolate swirl but I am so turned off of HD after my one and only time eating it. I had the chocolate chocolate chip gelato and it was actually bad (vs. good but not up to expectations). I know it's unfair to judge a brand on one flavor which may have melted in the store and then refrozen since that is what it tasted like, but with so many delicious options, I figured why bother? But then last week I had B and J cookie dough which is normally fantastic and it tasted bad...gritty and the cookie dough was dry and brittle, despite a very respectable expiration date. So maybe it was melted and refrozen too. Had this been my first experience with B and J I wouldn't have been impressed so maybe I need to give HD another shot, especially at $2/pint this week at Stop and Shop. Have others experienced the potentially melted and then refrozen phenomenon? Or is the gelato just bad? I feel like it must have been an off pint since most people rave about the brand. @Deb: Ummmmm, Haagen-Dazs has been around forever and is immensely respected in my mind, Ben & Jerry's is the upstart to the classic that is Haagen-Daz (though both are now senior players in the space). I know Nick and I will judge a flavor by a single pint, but that doesn't mean you should judge a brand by a single pint. If one of us had a bad experience, we would consult each other as well as the larger ice cream community and see how our experience lines up. I'm not saying taste buds are all alike, but there should be a theme or trend to how people are reacting. on top of all of that, it sounds like you tried their gelato lineup which is fading away. That is not the same as their ice cream. I've never had a bad pint of HD. I even ate a pint past the date on the bottom and thought "man, even freezer burned and gritty, I'm still impressed by what would have been"
some may be bored by their classic offerings, but you are doing yourself a disservice but not trying a few more pints of their actual ice cream. Finally tried it. I was reluctant given my lack of enthusiasm for HD and the mediocre reviews but it sounded too good to pass up, especially at $2.50/pint. Huge disappointment. Although enjoyable, it was essentially vanilla ice cream with Hershey's and a few brownie chunks. I couldn't taste anything special in the vanilla, so I didn't need it to be HD and the syrup definitely dominated, as people said. I like vanilla with Hershey's just fine but not when I wanted special! The brownies were too small but they were delicious. Super chewy... Better than BJ in my opinion. Not a repeat buy for me. I wouldn't judge HD vanilla based solely on this pint. Their vanilla is excellent but the fudge dominates here. Smashburger makes some excellent shakes based on their vanilla ice cream. Exactly...I loved their vanilla in the chocolate chip. That is why it was frustrating to have the syrup take over...It even just looked like a light chocolate. I love that combo, but I wanted to really taste a delicious vanilla. This could have been mediocre vanilla and it wouldn't matter much. Lose the syrup and it would have been so much better. I still think I'm a Ben and Jerry's girl though.